The suffering and massive loss of life caused by Tuberculosis (TB) are proof that humanity hasn't prioritised the development of tools to eliminate a disease dating back 9 000 years. Two stark facts highlight this: most of the antibiotics used to treat TB were developed decades ago. And, until very recently, some diagnostic approaches being used were a century old. There's a chronic funding gap for TB research and development. The Global TB Alliance estimates that it's as high as $1.3 billion per year. While still inadequate, there has been a shift towards reducing the funding gap over the last two years. This, together with invigorated research strategies from large funding organisations such as the National Institutes for Allergy and Infectious Diseases, point to a shift in the TB landscape. As a consequence, there have been some exciting and positive movements on both treatment as well as prevention aspects. There's also a growing appreciation that focusing on ensuring good treatment outcomes alone won't be enough to eliminate TB. The disease has to be viewed as continuum of care. Attention must also be given, for example, to how people access healthcare services and where they are lost in the system. TB, caused by the bacterium Mycobacterium tuberculosis, killed 1.6 million people in 2017, the highest number of deaths caused by a bacterial infectious disease. In addition, 10 million were infected with TB bacteria, the majority being poor people in the developing world. In Southern Africa, high rates of HIV infection have been the primary driver of TB disease to the point where the region is now home to the world's worst HIV-TB epidemic. In 2017, 1 million children were infected with the TB bacteria and 233 000 died of the disease. 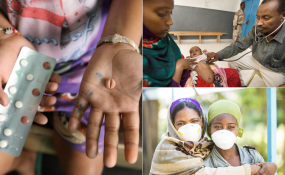 The scourge of drug resistant TB has necessitated treatment with antibiotics that cause side effects such as deafness, leading to extraordinary levels of human suffering. There were almost half a million of these cases in 2017. Signs of fresh energy to deal with the problem appeared on the horizon with the first WHO global ministerial conference in Moscow in 2017. Representatives from 120 nations adopted a declaration to rapidly achieve universal health coverage for eliminating TB. A year later, the United Nations held its first ever high-level meeting on TB. The UN convened the General Assembly with the goal of establishing an accountability framework to drive the goal of ending TB. A disproportionate disease burden among the poorest countries with crippled public healthcare systems. Two new TB vaccine studies have created a great deal of excitement about the development of a vaccine that would prevent infection or disease. The first study looked at how revaccination with the current vaccine BCG resulted in the protection of adolescents from infection. This suggests that BCG revaccination maybe be a useful TB prevention strategy. The second involved a clinical trial of a new vaccine candidate. This showed that it was possible to prevent adults who were infected with TB bacteria from developing active TB. These two studies have raised hope that creating a new TB vaccine is a definitive possibility. Advances have also been made on the treatment front. A recent study shows that it's possible to prevent people with HIV from developing active TB disease. The study showed that it is safe to administer antiretroviral therapy combined with a preventive TB treatment commonly known as the 3-HP to people living with HIV. Now that the safety of this treatment has been shown, the next step would be for the National Department of Health to consider the feasibility of making these drugs available to people with HIV through the public system. Research also suggests that the two new TB drugs that have emerged recently, Bedaquiline and Delamanid, can be administered together safely. This has important implications for creating new treatment options for drug resistant TB. Interesting scientific advances have emerged such as boosting the immune system with an approach called immunotherapy, to fight TB. This approach uses structures that are released by immune cells infected with TB bacteria to boost the activity of the immune response. In South Africa, recent studies have reported clinically useful biomarkers that predict future outcomes of infection and disease. These have also increased scientists' understanding of underlying TB disease mechanisms. These positive movements signal a shift in the landscape. But the world can't afford to be complacent. We cannot afford to lose momentum after coming so far. All nations, especially TB endemic countries, need to take up the call for action laid out in the UN declaration. But the world won't simply treat its way out of the epidemic with antibiotics. Interrupting transmission, developing a vaccine, protecting vulnerable populations, developing new diagnostics and better treatment regimens are all required for controlling the epidemic. Innovative and cost effective diagnostic and case finding approaches are desperately needed to strengthen health care systems together with more investment in research and development. Finally, we all need to advocate for more resources and better patient support. TB is everyone's problem - not just the poor and forgotten.